Does the Soviet School of Chess still rule? Mikhail Botvinnik, Soviet School icon. Chess has a storied history. There are many theories of its origin stemming from either India or China and going to Persia through the Middle East across the Sahara and into Europe. Some say that chess went through Central Asia and into Eurasia. Regardless of where chess started and how it got there, the form the Moors brought into Spain appears to be the precursor to the form that we play now. Today there is a question circulating… it pertains to the apparent changing of the guard in chess. With the retirement of Garry Kasparov, the changing of the guard had begun. The transition was not a smooth one and a scramble ensued within the disjointed chess world. In April 2010, World Champion Viswanathan Anand of India will meet Veselin Topalov of Bulgaria for the title. This may mark the first time in recently memory that someone from the former Soviet bloc is not competing for the title. Nearly eighty percent of the players in the recent FIDE World Cup were players from former Soviet bloc countries. 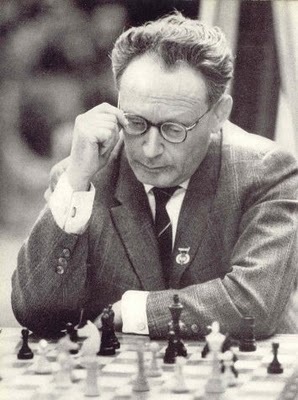 Botvinnik’s example and teaching established the modern approach to preparing for competitive chess: regular but moderate physical exercise; analysing very thoroughly a relatively narrow repertoire of openings; annotating one’s own games, those of past great players and those of competitors; publishing one’s annotations so that others can point out any errors; studying strong opponents to discover their strengths and weaknesses; ruthless objectivity about one’s own strengths and weaknesses. In the modern era, there were a lot of new talented players and the chess behemoth representing the Soviet Union was led by Anatoly Karpov followed by Garry Kasparov. The era from Botvinnik to Kasparov represented the glory years of the Soviet tradition and it remains an important time in chess history. Players like Kramnik have attempted to carry the torch. A young Viswanathan Anand, the man who would become World Champion of a new era. While many of the strongest chess nations were once a part of the Soviet empire, does the “Soviet School of Chess” still reign supreme in the face of rising powers such as China and India? One may believe the proof is still evident when approximately 70% of the world’s top 100 players are from Russia and the former Soviet republics. However, there are some changing trends. The trend of globalization has brought about a “chess wave” and currently the top three players are from Norway, Bulgaria and India. When Viswanathan Anand (right) became World Champion, it signaled a new era. Certainly a different time from when there was at least one “K” (Karpov, Kasparov, Kramnik) standing in the top ten for three decades. The former Soviet bloc still represents an influential and formidable tradition, but what has become of the “Soviet School of Chess”? 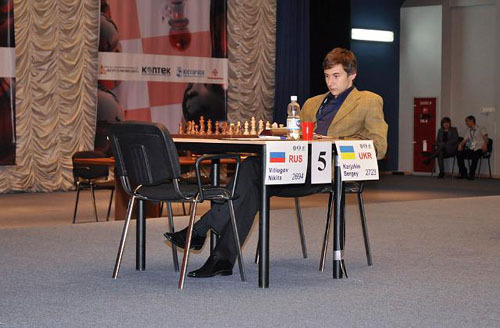 During the recent FIDE World Cup, there were 27 players from Russia competing out of 128. Nearly eighty-percent of the total players were from the former Soviet bloc. The tournament was won by a veteran from Belarus, Boris Gelfand, who now plays for Israel. Despite the high percentage of players from the outset, Russia did not place a player in the final match. As the largest Soviet remnant, Russia has not scored an Olympiad medal in three straight Olympiads and its players no longer dominate tournaments as before. However, the last eight players were from the “Soviet tradition”. Perhaps one can argue that the tradition is alive, but there are also other developments indicating that the balance of power is shifting. This is the cause of some concern from prominent Russian chess players. Back in 2006, Vladimir Kramnik complained about the lack of young talent coming up in Russia. He remarked that the veterans were indeed very strong, but needed to make way for young players with great stamina. Other nations in the former Soviet bloc seem to be thriving despite their small size. The Ukraine won the Olympiad in 2004 and Armenia has won in 2006 and 2008. Azerbaijan recently won the European Team Championship. Each of these teams have young stars making up a great part of their success. Of course, we cannot forget that both Israel (#3 in the world) and the U.S. (#8) consist of a number of “Soviet” emigres. 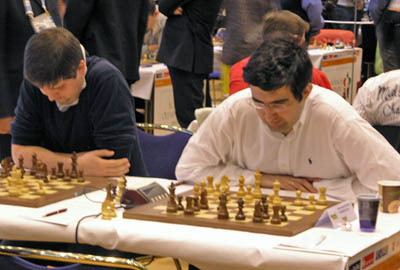 Russia’s Peter Svidler and Vladimir Kramnik at the 2008 Olympiad in Dresden. These two elite players work to bridge the gap of the old and new. Photo by Daaim Shabazz. Despite the ongoing success, was the “Soviet School” ever a monolithic ideology or was it a deep-seated culture that diverged into different approaches to chess? Certainly there are players like Gelfand and Kramnik who were direct descendants of the Soviet tradition and play a similar brand of chess, but Latvian players like Alexei Shirov was more influenced by Mikhail Tal, a World Champion often accused of playing “incorrect” chess. Alexander Morozevich has his unique style as well and seems to purposely go against the grain. If one has to answer whether the Soviet School is still relevant, there is no question that it is very much a force. However, times are changing and the method of assimilating mass amounts of knowledge in a short time (to reach a critical analysis) has overtaken the method of deeply analyzing select classic games and positions. Other regions have proved that other techniques can be used with great effect. Many of the promising juniors being produced today are from many parts of the world. Most do not have the benefit of a rich chess culture and ample support, yet they are making a mark and entering the upper echelon with improvised techniques. If we look at the rise of China, there may be an argument that there is a “massification” of talent, but that argument has not panned out yet. China has a very well-defined system for producing talent… a strong player as national trainer (GM Ye Jiangchuan) and government support. The number of players they produce is selective, yet all of the players appear to be very strong and well-prepared. Liu Wenzhe wrote a book about the “Chinese School of Chess” but it is not clear how close that model is being followed today. The nation has created a powerhouse in less than 30 years and its women have dominated chess for more than two decades. China currently holds the #5 ranking (behind Russia, Ukraine, Israel and Azerbaijan). They have produced four 2700s (Wang Yue, Bu Xiangzhi, Ni Hua, Wang Hao) and have a cadre of young strong players who are unrated and indeed ready to enter the chess stage. Li Chao and Yu Yangyi showed great promise in the FIDE World Cup, not to mention Hou Yifan, a legitimate talent. Wesley So represents a new era of chess players. Photo by Galina Popova courtesy of FIDE. India has the benefit of a great icon in World Champion Anand and perhaps more of a massification effect in terms of young talent. 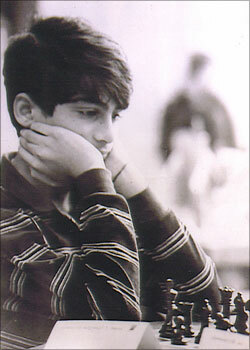 We are witnessing the “Anand Effect” or “Anand Boom” similar to what happened in the U.S. with Bobby Fischer. India has excelled in many of the age group world championships and in 2008 won both the boy’s and girl’s junior titles. Overall, India is now ranked as the #6 federation (counting the top 10 players) with a large, active population of chess players. The players have strong support from the corporate sector, but internal rankling could slow process. 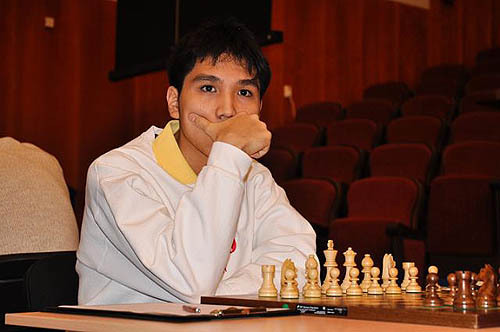 Vietnam and the Philippines have begun to show promise with young talent such as Le Quang Liem, Nguyen Ngoc Truong Son and Wesley So. Cuba has led the way in showing that there are other methods for producing elite players and have Lenier Dominguez. Iran has also made tremendous strides in producing strong talent. In North America, there is Hikaru Nakamura who has soared over 2700 and is has developed a unique approach to chess development. Last but not least, the world’s #1 player is Norway’s Magnus Carlsen. Carlsen was trained primarily by fellow Norwegians without extensive support, but developed into an elite player. This occurred long before his alliance with Kasparov. What does all this mean? It means that while the Soviet School of Chess still has tremendous influence in terms of chess training, literature and tradition, methods are evolving quickly. The methods still show results, but is perhaps losing ground. Kramnik has made such comments in a 2006 interview when asked about the rising Russian players. In Dresden, it was not to be. Armenia would take gold again on the strength of Levon Aronian and Gabriel Sargissian. Israel took silver and the U.S. took the bronze. For the time being, Russia, the Ukraine, Israel, Azerbaijan and Armenia will keep the tradition strong, but how long will the influence of the “Soviet School” last? Garry Kasparov was perhaps the first player from the Soviet School to make effective use of the traditional methods along with the use of databases. Players like Ruslan Ponomariov, Teimour Radjabov and Sergey Karjakin are steeped more in the information age than previous generations, but one can still see the influence of the Soviet tradition. The idea of studying classic games is invaluable as are the deep studying of middlegame positions. These methods had been practiced in other parts of the world for a long time. There was no other way to develop a deep understanding of chess prior to today’s wide distribution of audio/visual education material. Today, the methods used have changed. Younger players are finding other ways to practicalize their preparation. Online chess allows an incredible amount of trial and error and experience-building. When this is combined with detailed analysis and annotation of games, it makes a powerful method. Sergey Karjakin… straddling between two traditions? Photo by Galina Popova courtesy of FIDE. Viktor Korchnoi has been very critical of the new generation by saying that too much reliance is placed on computers and databases. One thing for sure… computers and databases are here to stay. Other nations are certainly benefiting from the mass amount of data, powerful engines and access to strong players on the Internet. In interviews, Anand has described the role of computers in “leapfrogging” and leveling the field. Despite the narrowing gap, Anand admits that Russia is still “one of the strongest.” The methods as taught by many former Soviet trainers will still have some relevance, but will require some adaption if they are going to continue to be effective against players who require speed and volume of many games over the depth and critical analysis of fewer games. The Soviet School as we know it will never be the same. Eventually, it will be influenced by a more dynamic pedagogy. With globalization of information and the rise of new chess powers, it’s going to be exciting to see where the world of chess is headed. Interesting interview on Magnus Carlsen who is demonstrating some differences in how to approach chess excellence. When asks if he used a chess set for analysis, he said he doesn’t know if he has a chess set! The problem I have with the article is that an inexperienced interviewer still believes in the myth that being an elite chess player makes you infinitely more intelligent than the next person. It does not. It merely means you know how to play chess better than the next person. What about the Russian school. What is the explanation for its setbacks in chess? No, I think Russia is still one of the strongest chess nations in the world, of that I am sure. It is just that it has become a lot easier to study chess, and so others have been able more easily to catch up with the Russians. But I think that, at the last European team championships, the Russians were just unlucky – they narrowly missed gold and had to settle for silver. But I still think your country is one of the strongest, only they just don’t dominate like they used to. I believe Asia offers a very good case study for Africa Chess. Our governments still need to awaken to the beneficial effects of chess to the cultural and cognitive well-being of a country. Asian governments give chess massive support. Iran, India (which I visit in 2006 and experience first hand) China, UAE, etc are case in point. The quickest way in which Africa will generate the needed momentum to get massive state support for chess is if the FIDE President takes a grand tour of Africa. His position as a Head of State plus FIDE President will ensure that interest in chess will be high during and after his visit. Perhaps it may have happen way-back, but I cant recall such a monumental visit by the FIDE President to Sub-saharan Africa. I agree with your view. I have written this repeatedly, but I do realize the differences in the regions. India is a poor nation, but they have a growing tech sector and many of the companies have sponsored players. Perhaps the most notable company is NIIT, the company that sponsors Anand. I was glad that Anand came to Botswana, but I was very disappointed that the event did not get any coverage in the African press. This is one of the main problems in getting the momentum you spoke about. I remember a conversation with Amon Simutowe shortly after he earned his GM title. He mentioned the idea of taking a tour of African countries to promote chess. Awhile back, I had also considered such a “Chess Drum Tour”. Amon and I have traveled together before, but a tour would take a lot of planning and will most likely require sponsorship. The Black Scholar: Barack Obama 2009 Vol. 38 No.4 (see Cover}. I went over a few games from the ongoing tournament in India and the Russian event thats in process now ,its clear they realize they gotta play catch up to U.S. , Wutang, that cut from Raheem/Luda, is Ice Cold – Bulletproof! and Jay Z with Alicia Keys! man,she got my “mind playin tricks on me” with that N.Y. cut, actually yall fellas ahead of everybody in chess but im not going there right now! The “Russians” as Bobby would say gave us a great perspective of Chess, however ,they know what time it is,Fide too, See Susan im not so bad after all, huh? hehehe. Peace. A well-written, timely piece. Congratulations on stoking the “flames of intellect”. It is all about the culture. Rusia still has the best chess “culture” and is the best chess country in the world although it has not done as well it hoped in the past three Olympiads. That is why its players dominate the various lists etc. This has led to an intriguing situation in world chess – not just in team events but in individual competitions such as the recent World Cup event won by Gelfand. Countries in Africa, Asia and the Caribbean will not do well until chess is incorporated or inculcated as a way of life for the people. For example, in Jamaica we are fighting a serious war to have the authorities make the necessary decisions to have chess on the school curriculum as a policy. If we manage to achieve this then, in time, chess will not only rival athlectics (producing the equivalent of the Asafa Powells and Usain Bolts) and football/soccer (Reggae boyz) but will surpass those sports. In my humble opinion, for a country to develop seriously chesswise the game must become a general part of the psyche of the people, appealing to key players in both the public and private sectors and creating virtually a new industry. With that will come sponsorship and the numbers and with the numbers will come the mass “infiltration” of the sport that will unearth the world beaters. With the numbers wil come many events; with the events will come greater competition and experience and ultimately players will get stronger – especially after a regular diet of playing strong, foreign opposition. This is what happened in athlectics with Usain Bolt et al and it will happen with chess. I have been communicating with a number of persons from various countries and am planning a strategy (after all, are we not chess players!!???) to achieve the goals. President Ali Nihat from Turkey and I have discussed the matter and the Turkish model is not to be frowned on – c. two million students learning right now. The players in the African countries can be world beaters with their history of determination and resilience. What is crucial is the political will and oftentimes people are needed to “nudge” that political will in the right direction. Russia and the other top nations from the former Soviet union and other countries are better right now because they have a really serious chess culture. Their children often live and breathe chess just as Jamaicans live and breathe track and field. You must be good when you do that! It is time we got serious and adopt some of the more salutary policies and practices of these “chess countries” if we are to progress. I urge administrators in every country not to give up in spite of the challenges that are frustrating and can seem quite insurmountable but to redouble their efforts because “a good thing never dies”. This is crucial because a chess culture in a country is not important for sporting reasons solely but can redound to the benefit of all concerned from a socio-economic perspective with improved literacy among the people, a better GDP, reduction in crime and violence etc. Russia has the history and culture, but their decline is occuring for three reasons… (1) break up of Soviet Union (2) chess player “brain drain” to other nations (3) decreased government support and (4) widespread use of information technology. Russia is certainly strong, but if you have an Olympiad team with an average rating of 2750 and you cannot win a medal, something is gravely wrong. What’s worse is that they may not win a medal in 2010 either. They cannot field a stronger team than in Dresden. I believe this is Azerbaijan’s turn to shine. Armenia, China and Israel will provide competition for the medals… so many sharks in the ocean now. Russia will gain Sergey Karjakin so maybe that will help. Ukraine will suffer, but they have some great young talent. I like some of the activity I see in the Caribbean. I believe your idea of hosting the strong invitationals are the way to go instead of waiting every two years for Olympiad. Both Barbados and Trinidad have begun hosting good invitiationals while Bermuda and Curacao have done well too. However, I’m not sure I endorse Turkey’s “massification” model. If he wants to produce strong players, he should not play the numbers game. Ali probably figures out of two million players, he’ll get some good talent and groom them. I do admire what he has done; however, I believe it’s inefficient use of resources. If he is doing it for education, then it’s a good approach; if he’s doing it to produce Grandmasters, I’m not so sure… we’ll see. Maybe. Take China on the other hand. They are not using the massification model and are carefully grooming a cadre of strong players. Many opine that China doesn’t have many names on the top junior lists. That’s because they develop ahead of the curve. Who had heard of Wang Hao, Li Chao or the recent sensation Yu Yangyi? They came quickly and I believe all skipped the IM title. India is using a variation of massification model, but they have a great icon in Anand to help get support. India’s 100th player is 2300+ ELO while China’s 100th player is not yet 2200. India has a chance to make a strong presence, but something is missing. Koneru Humpy seems to have topped out and some of the men seem to have stagnated a bit. What is the model to keep the momentum going? I believe Anand plays a big role here, but most countries do not have such a resource. The state of chess in Africa appears to be in a state of limbo. As I stated, little coverage was given to Anand’s visit to Africa. The continent continues to be neglected and federations are very small. While Kirsan Ilyumzhinov held a World Cup in Libya, very little has been done on the continent apart from the CACDEC funds. Where will the investment come from? Here is a rare photo of a Mikhail Botvinnik and some of his students at his school. 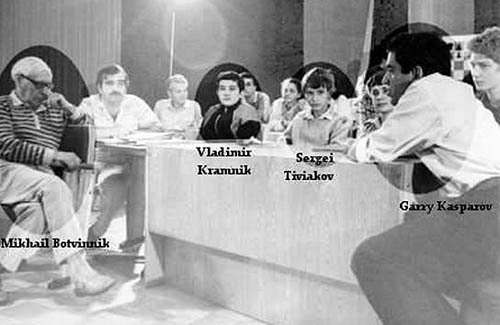 The picture is labeled but doesn’t include Alexi Shirov who is sitting on Kasparov’s right. Interesting story about the Soviet School of Chess below. It is interesting that whenever I ask someone to define the term and/or methods, they are unable to do more than give very unoriginal ideas. I’m not sure there was a “Soviet School” but there was a culture developed. Very interesting interview with Boris Spassky at 2008 Olympiad in Dresden, Germany. I was at this interview. The former World Champion talked about The Fischer match, chess psychology, chess marriages, Fischer-Karpov match, Russia’s future. Spassky said he is looking at Russian chess pessimistically, but that youth chess is still strong. Here is a story about Le Quang Liem and the Soviet School of Chess. Hopefully, his past trainers will not go overboard in claiming credit for his success.